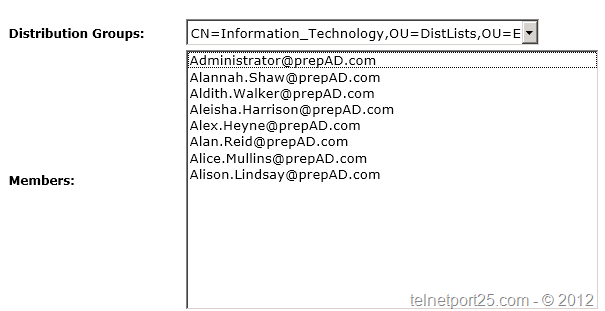 I am working on a new application at the moment which requires for all Distribution Groups within an Exchange 2010 environment to be populated into a Drop Down list on the default ASP.NET page, and then based upon the selected Distribution group place the SMTP addresses of each member of that group into a list box. Having a hunt all over the web to see if this has been done before (well I say “all over the web”, maybe about 0.016% of it!) – I could not find a code example which quite met my needs. Therefore I decided to have a crack at it myself – and to my surprise came up with the following code which works! (I am not saying that it is the most efficient way of doing it – just that it works). Of course there might be more efficient ways to accomplish the above (which if you have come across, please feel free to link them in the comments section) – but I thought that this might help someone out along the way. Does this handle nested groups? How about dynamic distribution groups? I recently had to write a Powershell script to dump out all members of a distribution group which contained other distribution groups, security groups and dynamic distribution groups. It wasn’t as easy as it sounds! How did you get Dynamic Groups? Can I ask you to share your script? Did you get the dynamic Groups? Did you get the script? Can you share it?